This week at Bungie, we’re mapping the next game changer for your Guardian. If you checked in with us last week, we teased you with the next upgrade for Destiny. With the dust from 1.1.1 still settling, it wasn’t yet time to dig into new details. We could only say that you’ll download it before the House of Wolves arrives. Until then, we’ll call it 1.1.2, because a fancier name like “Claude” or “Miguel” wouldn’t help us with version control. For now, we can start to talk about what it will contain. Once again, it will add some new features to the game – and fix some old ones. Let’s plot a course to what’s next, and see if you like where we’re headed. Ever since Destiny went live, there have been various teams at Bungie. 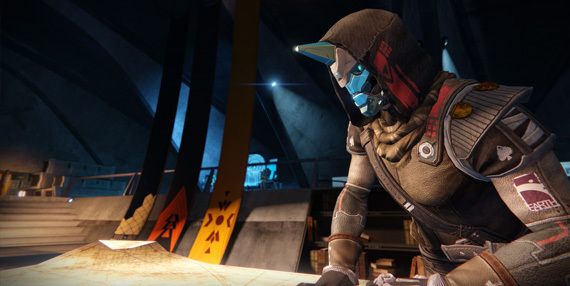 We’re all working on Destiny, but different teams have goals for different projects. We’ve specialized to meet the needs of this sprawling community. Each class of developer has a specific focus. Some of them are creating new adventures for your Guardian – those both revealed and still secret. One of the goals of the Live Team is to listen to the player and improve their experience. They hear your voice when you tell us what you want. They react to what you’re teaching us as citizens of the world we built. ・Audio and Visual – Not everyone wants to see or hear a game the same way, which is why we’re looking at providing more options. ・PVP Ammunition – The Crucible team wants to change the way ammo crates dictate the flow of a battle. ・Strikes – The numbers tell us that there are some missions that are successfully completed far less than others, inspiring us to look at why people quit.